In acute myeloid leukemia (AML), primary refractory or relapsed disease, secondary AML, and leukemia with unfavorable genetics are considered high-risk AML (hrAML), with allogeneic stem cell transplantation (SCT) representing the standard treatment. Sequential conditioning has been successfully used for SCT in hrAML in HLA-matched transplants, and found its way into HLA-haploidentical SCT (haplo-SCT) later on. Hence, sequential conditioning had become standard for all patients with hrAML in our two centers, regardless of donor type. Thereby, HLA-matched family or unrelated transplants were first/second choice, post-transplant cyclophosphamide (PTCY)-based haplo-SCT was chosen in patients missing matched donors or requiring urgent transplantation. To compare the outcome after HLA-matched and haplo-SCT for hrAML following sequential conditioning, we performed a retrospective, matched-pair comparison, using disease stage, genetic subgroups and age as matching criteria. Thirty-four well-matched pairs were identified. At SCT, patients (median age 54 years) were untreated (9%), had remission (13%), or active disease (78%). 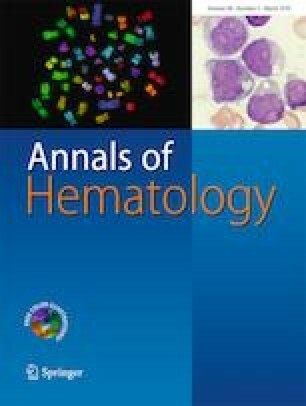 Three-year overall and leukemia-free survival (OS/LFS) of the entire cohort was 56 ± 7%/49 ± 7%, without significant differences between donor types (OS after HLA-matched/haplo-SCT 62 ± 10%/52 ± 9% (p = 0.21), LFS 53 ± 10%/46 ± 9% (p = 0.26)). Similarly, the cumulative incidence of relapse, non-relapse-mortality and chronic GvHD, as well as GvHD-free, relapse-free survival (GRFS), and chronic GvHD-free, relapse-free survival (cGRFS), were comparable. However, a higher incidence of acute GvHD ≥ II° was observed after HLA-matched SCT (15 ± 1% versus 50 ± 2%, p = 0.001). In conclusion, sequential conditioning SCT achieved remarkable results in hrAML, independently from donor type. PTCY-based haplo-SCT produced results that were comparable to HLA-matched SCT and can be used as an alternative option. Maximilian Doppelhammer, Alessia Fraccaroli, Christoph Schmid and Johanna Tischer contributed equally to this work. The online version of this article ( https://doi.org/10.1007/s00277-019-03593-2) contains supplementary material, which is available to authorized users. The authors wish to acknowledge the dedicated work of our nurses in both transplant units, as well as an excellent data management by M. Rothmayer, A. Bader, and D. Engels.